﻿ Sitio Reden Pension House, Palawan - SAVE ON AGODA! Have a question for Sitio Reden Pension House? 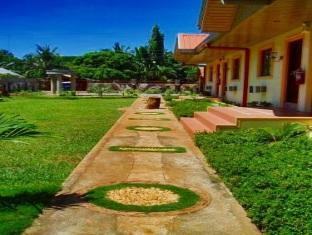 Ideal for fun and relaxation, Sitio Reden Pension House is located in the Puerto Princesa area of Palawan. From here, guests can enjoy easy access to all that the lively city has to offer. No less exceptional is the hotel's easy access to the city's myriad attractions and landmarks, such as Puerto princesa city colesium, Puerto Princesa Airport, NCCC Mall. Offering hotel guests superior services and a broad range of amenities, Sitio Reden Pension House is committed to ensuring that your stay is as comfortable as possible. While lodging at this wonderful property, guests can enjoy Wi-Fi in public areas, airport transfer, family room, tours, laundry service. Hotel accommodations have been carefully appointed to the highest degree of comfort and convenience. In some of the rooms, guests can find internet access – wireless, internet access – wireless (complimentary), non smoking rooms, air conditioning, desk. Whether you're a fitness enthusiast or are just looking for a way to unwind after a hard day, you will be entertained by top-class recreational facilities such as massage, garden. When you are looking for comfortable and convenient accommodations in Palawan, make Sitio Reden Pension House your home away from home. rooms are big..hotel is clean. its very nice hotel..its in a garden.. rooms are big and clean..not much moquito..air conditin is woring good..hot water also.. but this hotel has two big problems. one is far from the down town..u can go there by tricycle but tricycle drivers are asking much money when they understand u are a foreigner..u need to always make bargain and its something tiresome..its almost 4 km far from the down town its very hard to walk. the secdond big problem is owner of the hotel is not around..i never seen he/she in 3 days.. there are 3 girls and their mothers take care to hotel..the girls are at the age of kid..and her mom is good woman and she cleans to house and cook breakfast.. becoz of u can not see hotel owner\ when u need ask something about palawan or city or else u are only asking to the kids and u cant get enough answer. When I arrived at Sitio there wasn't anyone there to help me check-in. The ground's keeper did not know I was coming, and after a few phone calls I was finally given a room that was not cleaned. The maintenance person tried to clean it very quickly, and I had to ask for the sheets to be changed. I was told that they would book me on a tour, but that never happened, and the next day in the morning there still wasn't anyone there by 9:30 to help with anything. I left the next day, and I was told that I would be reimbursed for the two nights I booked- That never happened! I spent one night there, but was charged two nights. The worst part is that it was a waste of my vacation time. The wifi is not good. Do not change beddings in my entire stay. No change of towels.